This sounds really weird, but I love names. I love reading books with characters who have super pretty names or just cool names in general. For some reason, I’ve always liked names. Coming up with names for characters can be super stressful, but I love it because I’m discovering all these awesome new names all the while trying to find the perfect one. And of course, honorable mentions go to Angelica, Eliza AND Peggy from Hamilton! Yes, all three of them were real people, but I would love to have three cats at once all named after the sisters. I also love the name Adelina from The Young Elites, but it’s so similar to my name, I would never use it. What are some of your favorite character names? If you were to name a pet or child or something after a fictional character, who would it be? Let me know in the comments, and don’t forget to link your TTT post! OMG, Bellatrix would be the PERFECT pet name!!! 🙂 Great list, I love Emilia as well! Hahaha I cannot imagine calling my cat Bellatrix. I love the name Emilia! I even read Salt to the Sea and I forgot about it! I think Bellatrix is such a cute cat name, ha! I love the name Emilia in general, not just for my cats, though it’ll probably be used for a cat. Auggie is such a great cat name! I’m allergic, but if I wasn’t it would be at the top of the list! Great choices! I think Auggie is such a great name for all sorts of pets! That’s too bad though, I’m sorry. I have lots of friends who are allergic as well. YES, I can totally relate to this. So far all my pets have been shared with my family so I didn’t have total say on what to name them but SOON. ALL the fandom names shall be used xD Love Inej and Jem for cats. A soon as I move out I plan to adopt lots of kittens and puppies, giving them all the fandom names like you sad, haha. Inej and Jem are such cute cat names, even just Jemmy. So many great names on your list! So many wonderful names in this list. Emilia is definitely a favourite of mine. Inej and Nikolai are also epic names and ones I’d probably give to my future cats because I love the characters so much haha. Haha, thank you! Aren’t they just so adorable?! This is actually such a great list of names. I can totally imagine cats with these names. Now I really want to get a cat just to call it Lysandra. Thanks, haha, and thanks for stopping by! Lysandra is such a sweet name for a little kitten. Thank you for stopping by! Aren’t they perfect? Isn’t it just the cutest?! Thanks, and thank you for stopping by! Bellatrix – should have added that to my list! Bellatrix may be a pretty terrible character personality wise, but it’s still a great name. Thanks for stopping by! We did the same thing for our TTT! We didn’t choose any of the same names, but I had two Harry Potter names, too – Crookshanks and Luna! And now I REALLY want a cat named Lysandra. Crookshanks would be so cute, but he was such a moody grumpy cat, I wouldn’t want to jinx it. Luna is such a cute name either way though. Thanks for stopping by! Thanks you, and thanks for stopping by! There are too many Harry Potter names that would be great for pets, Minerva and Bellatrix are my favorites though! Awww, Auggie is a cute one for a kitty! Nice pick! I’ve heard of dogs with the names, but I think it would be super cute for a little ginger cat especially. Thanks for stopping by! 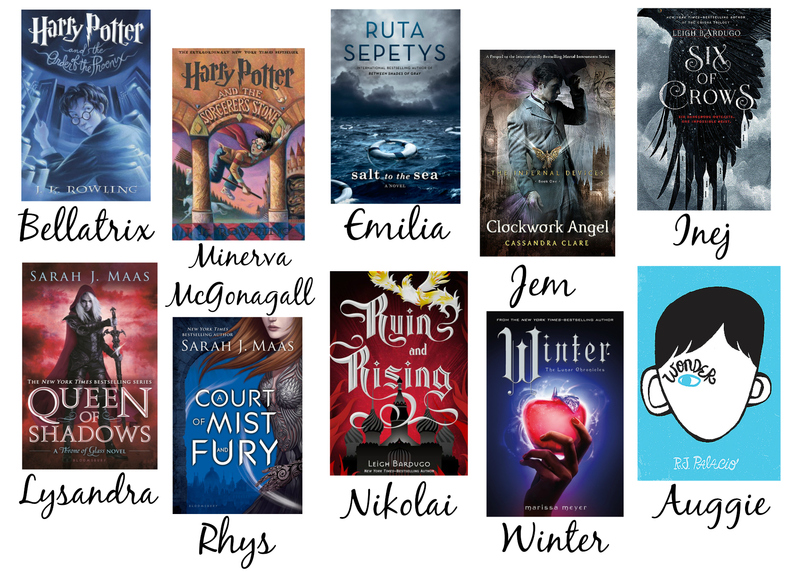 Great list, a lot of those books are in my TBR. Bellatrix would be a great name for a moody cat! Definitely, or for a black cat too. Thanks for stopping by!